*Scott has been coaching with the Panthers on and off since 2009. Scott grew up in North Battleford, Saskatchewan. After graduating from University of Alberta in 1998 he began teaching. Scott has been teaching at Medicine Hat High School since 2001. Currently, Scott is the International Student Coordinator for the Medicine Hat Public Schools District No. 76. As an athlete, Scott competed in Track and Field at the varsity level and national level. 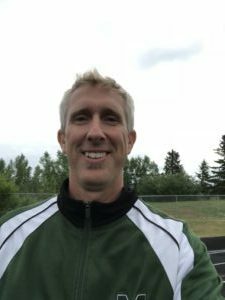 He represented the University of Saskatchewan and Minot State University in High Jump. Scott competed track in North Battleford winning gold medals in High Jump at the Provincial and Summer Games levels. Attended Jr Nationals in Sherbrooke, Quebec in 1993 finishing 5th. Attended Minot State University for Track and Field- won the Indoor State Championship’s clearing 6’6.5” in 1994. Scott has a love of coaching. He has been coaching multiple sports and specifically track and field athletes helping them to find success.